It’s the last Saturday of the month, which means it’s Give a Sh*t Book Club time! 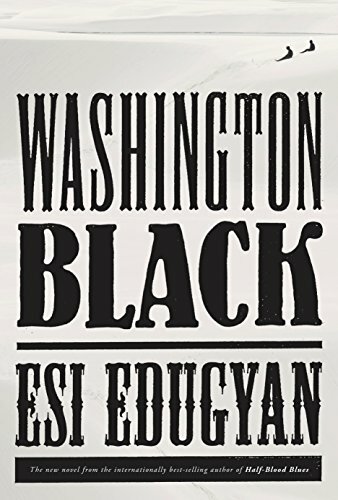 This month’s pick is Washington Black by Esi Edugyan, which was recently nominated for the Booker Prize. Washington Black is a slave narrative unlike any I’ve read before. For one, most of my own reading about slavery has been focused on the United States, so Wash’s life in Barbados on a sugar plantation was a new perspective for me. One aspect that really hit me was Wash’s conversation with Kit about going to Dahomey when they die. Thinking of one day returning home gives Kit hope, but for Wash, who was born into slavery and has never known a free land, even the promise of an afterlife rings hollow. It emphasized to me just how much Wash had lost before he’d even begun his life. Even his home was tainted with pain and suffering. I really appreciated that the story was explicitly not about a white savior. Titch may have saved Wash from the worst of field work, but he subjected him to danger in other ways. And as we see from their confrontation at the end of the book, Titch never truly saw Wash as a person equal to himself. Wash understandably latched onto Titch as a father figure, but I don’t think Titch ever saw Wash as a son. Rather, he was a tool to be used in Titch’s scientific quest. It was sad to me that Titch chose not to offer Wash a loving, supportive relationship when he so clearly wanted that from his own father. Edugyan captures well how the horrors of slavery go on, even after the institution itself is abolished. Wash escapes the scene of the suicide with his life, but then he is on the run with a bounty on his head. Then slavery ends, and you think he’ll finally be safe, but then he finds he’s still being pursued by Erasmus Wilde’s crazed bounty hunter. Through it all, Wash wonders what fate befell Kit and the other slaves left on the plantation and suffers guilt that he managed to leave. Wash was constantly describing himself as anxious, nervous, terrified—rarely if ever was he able to let his guard down, even with people he should have been able to trust. Imagining living a life in constant tension like that wrenched my heart. I’m not sure what to say about the ending. I can’t ignore the clear parallel between Wash walking out into the sandstorm and Titch walking out into the Arctic, but it’s hard to accept that that’s the end of Wash’s life. If we are supposed to assume that Wash walked into the desert to die, I suppose it’s an ending that rings true. I just wish it had gone another way. I’d be interested to hear other possible interpretations of the ending, if you read it a different way. Comments are open below. I can’t wait to hear what you thought of this one!